INTROIT The Lord hath brought you into a land flowing with milk and honey, alleluia: let then the law of the Lord be ever in your mouth, alleluia, alleluia. (Exod: XIII.) Give glory to the Lord, and call upon his name: publish his works among the Gentiles. (Ps. CIV.) Glory be to the Father, &c.
COLLECT O God, who by the Paschal solemnity, hast bestowed remedies on the world, continue, we beseech Thee, Thy heavenly blessings on Thy people, that they may deserve to obtain perfect liberty, and advance towards eternal life. Through. LESSON (Acts, X. 37-43) In those days, Peter standing, up in the midst of the people said: You know the word which bath been published through all Judea: for it began from Galilee, after the baptism which John preached, Jesus of Nazareth: how God anointed him with the Holy Ghost, and with power, who went about doing good and healing all that wire oppressed by the devil, for God was with him. And we are witnesses of all things that he did in the land of the Jews and in Jerusalem, whom they killed, hanging him upon a tree. Him God raised up the third day, and gave him to be made manifest, not to all the people, but to witnesses pre-ordained by God: even to us, who did eat and drink with him after he rose again from the dead. And he com­manded us to preach to the people, and to testify that it is he who was appointed by God to be judge of the living and of the dead. To him all the Prophets give testimony, that by his name all receive remis­sion of sins, who believe in him. INSTRUCTION St. Peter concludes his sermon on the Resurrection with the declaration, that all who believe in Christ will through Him receive forgiveness of their sins. To obtain this remission a faith actuated by love is necessary, which will manifest itself in the exercise of good works. Endeavor to have this faith, if you wish to obtain the forgiveness of sin and eternal happiness, for without good works faith is dead, and forgiveness of sin and eternal salvation are promised only to those who possess an active faith. GOSPEL (Luke XXIV. 13-35.) 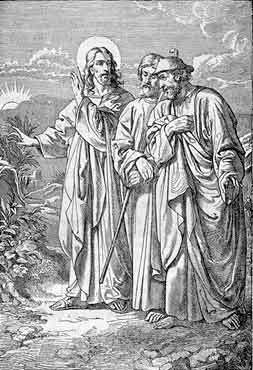 At that time, Two of the disciples of Jesus went the same day to a town which wassixty furlongs from Jerusalem, named Emmaus; and they talked together of all these things which had happened. And it came to pass, that while they talked and reasoned with themselves, Jesus himself also drawing near went with them: but their eyes were held that they should not know him. And he said to them: what are these discourses that you hold one with another as you walk, and are sad And the one of them, whose name was Cleophas, answering, said to him: Art thou only a stranger in Jerusalem, and bast not known the things that have been done there in these days? To whom he said: What things? And they said: Concerning Jesus of 'Nazareth, who was a prophet, mighty in work and word before God and all the people: and how our chief priests and princes delivered him to be condemned to death, and crucified him. But we hoped that it was he that should have redeemed Israel: and now besides all this today is the third day since these things were done. Yea and certain women also of our company, affrighted us, who before it was light, were at the sepulchre, and not finding his body, came, saying that they had also seen a vision of angels, who say, that he is alive. And some of our people went to the, sepulchre: and found it so as the women had said, but him they found not. Then he said to them: O foolish, and slow of heart to believe in all things which the prophets have spoken ! Ought not Christ to have suffered these things, and so to enter into his glory? And be­ginning at Moses and all the prophets, he expounded to them in all the scriptures the things that were concerning him. And they drew nigh to the town, whither they were going: and he made as though he would go farther. But they constrained him, saying: Stay with us, because it is towards evening, and the day is now far spent. And he went in with them. And it came to pass, whilst he was at table with them, he took bread, and blessed and brake, and gave to them. And their eyes were opened, and they knew him: and he vanished out of their sight. And, they said one to the other: Was not our heart burning within, us; whilst he spoke in the way, and opened to us the scriptures? And rising up the same hour they, went back, to Jerusalem: and, they found the eleven gathered together, and those that were with them, saying: the Lord is risen indeed, and hath appeared to Simon. And they told what things were done in the way: and how they knew him in the breaking of bread. Why did Christ appear as a stranger to these two disciples? Christ conformed himself to their state of mind; for these disciples, as it appears, did not yet believe that He was, God, although He had often declared that He was; and proved it beyond contradiction; they regarded Him as a prophet and doubted His Resurrection. They looked at Him up to this time only with their outward eyes., that is, without faith in His divinity, and therefore the Saviour did not reveal Himself to their soul. It is thus that God generally proceeds towards us. He makes Himself known to us and gives us His-graces in proportion to our faith, hope, love, and fidelity. Then Christ did not suffer voluntarily, but by compulsion, since He says: Ought not Christ to have suffered? Christ gave Himself voluntarily up to death, as said by Isaias; (LIII. 7.) but at the same time He was obliged to suffer, that the decree of His Father, and the prophecies might be fulfilled; that our redemption, which required the price of His death upon the cross, might be effected; and that we might learn from His example to enter heaven by suffering. How did Christ expound the Scriptures to these disciples? It is probable that He showed them how His passion and death were foretold and prefigured in various ways; that He was sold like Joseph, and that His scourging was prefigured by the blood-stained coat of Joseph. He probably drew their attention to the ram which was ensnared in the thornbush, and His crowning with thorns; He carried His cross to Mount Calvary as Isaac, loaded with the wood on which He was to be sacrificed; was deprived of His clothes and derided in His nakedness, as Noah by his son. His crucifixion was prefigured by the serpent Moses set up in the desert. The animals prepared for sacrifice in the Old Testament, and especially the Paschal lamb, were types of Him, who, like them, was killed and sacri­ficed on the cross, without having His bones broken; finally, Jonas who was three days in the whales and then came forth again, imaged Christ's death, burial; and resurrection. He showed them, also, how clearly David and Isaias fore­told and described His passion. Why did Jesus appear to be going farther? To give them an occasion of showing their love for Him a stranger, whom they did not recognize as God; and also to give them an opportunity of practicing a work of charity, for it is pleasing to God that we hospitably invite and entertain strangers. Thus did Abraham and Lot entertain angels in the form of strangers, and saints in the New Testament have done likewise to Christ Himself. How did the disciples recognize Him in the breaking of bead? Because, as the holy Fathers believe, He gave them then His sacred body as He did to the apostles at the Last Supper, the description of which they had undoubtedly heard. What else have we to learn from this gospel? That when we have received Christ at Easter in the Blessed Sacrament, we should beg Him to stay with us, for the evening of our life draws near.